On Nov. 6, 2000  on the eve of what would become one of the most contentious and controversial elections in U.S. history  Bush appeared in Bentonville, Arkansas for one last stump speech. 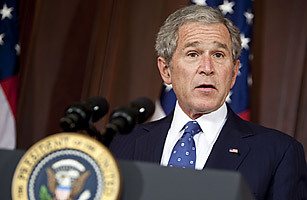 Explaining his unlikely victory over Republican rival John McCain to clinch the party's presidential nomination, Bush explained how his opponent and his advisors had not simply understimated him, nor merely misunderstood him. Oh no. "They misunderestimated me," he boasted, coining a term that would stick with him for the rest of his presidency.